1) Consortium led by Incheon Airport (Korea) is a successful tenderer for the Hanthawaddy International Airport project. 2) Mitsubishi-Jalux Inc. (Japan) consortium is a successful tenderer for the Mandalay Airport project. 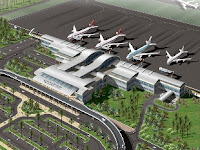 3) Pioneer Aerodrome Services (Myanmar) consortium is a successful tenderer for the Yangon International Airport Project.